Natalie is using Smore newsletters to spread the word online. I need five ingredients for the cookies: flour, butter, milk, eggs, and sugar. I need five ingredients: for the cookies, flour, butter, milk, eggs, and sugar. 1. My boss said he expected me in his office at 1245 sharp. 2. My house is unusually quiet today I know I will be getting a lot of work done. 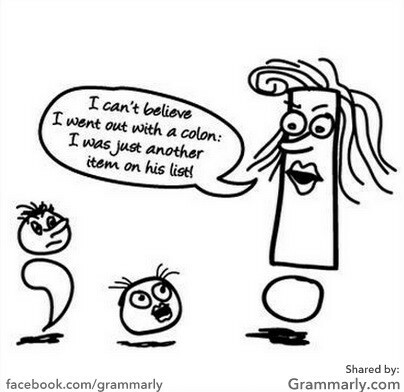 Act "Stronger than a comma, less formal than a colon, and more relaxed than parentheses" (9). *1. His first thought on getting out of bed–if he has any thought at all–was to get back in again. 2. All of my schoolwork–physics, history, calculus, and french–was strewn across my bedroom floor when I fell asleep last night. Side note: Dashes may be omitted when they disrupt the flow of the writing too much. -Other nouns are connected to it by, "with, as well as, in addition to, except, together with, and no less than." -None means "no one" or "not one"
-A pronoun in comparison is nominative if it is the subject of a state or understood verb. -The possessive case of pronouns is used to show ownership. The adjectival for is "your." The noun form is "of yours." 1. The football team beat Porter Ridge by more than they beat Myers Park. 2. The teacher took him out of class for not wearing a nametag and sent him to the lady who enforces the rules. Come under the same rule if they begin a sentence. Without the definitions of the words, the questions were impossible for me.